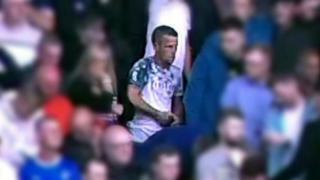 A man who admitted throwing a bottle into a crowd of Aberdeen fans at Pittodrie during a game with Rangers has been been handed a football banning order for 18 months. The incident happened in August last year, and police later issued a CCTV appeal for information. David Roy, 44, from Glasgow, admitted culpable and reckless conduct. At Aberdeen Sheriff Court, Roy was also ordered to carry out 135 hours of unpaid work.